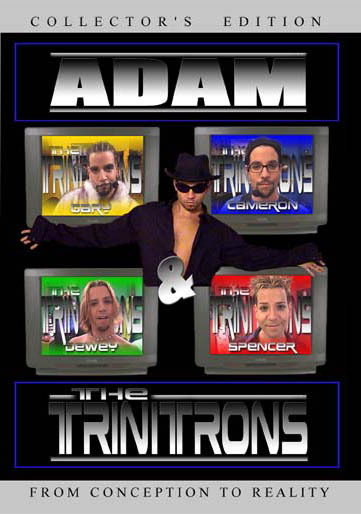 Buy this DVD with The Trinitrons 2 - When A Band Loves A Woman DVD ~ Adam Kontras today! Vitals & Favs of "The Boys"
Take a journey throughout Hollywood and see what's been hailed as the most inventive one-man show ever created. Seamlessly morphed together, these 7 venues mark the first year run of Adam & The Trinitrons in LA. However, the show is just the beginning. Go behind the scenes and see how Adam transformed into each band member along with deleted sequences and outtakes from the July 2001 shoot. This DVD is quite an amazing peice of work. The performances are hysterical! Adam is such a talented entertainer. The way he mixes the music and singing with the plot lines is an outstanding technical acheivement. I really love the "G" and "Spence" characters, Cam's kind of an asshat though. Overall very impressive DVDs, but where in the heck are those "easter eggs"? SBL is wrong; Cam is NOT an "asshat." Then again, as the cooler older brother myself, I can totally relate. 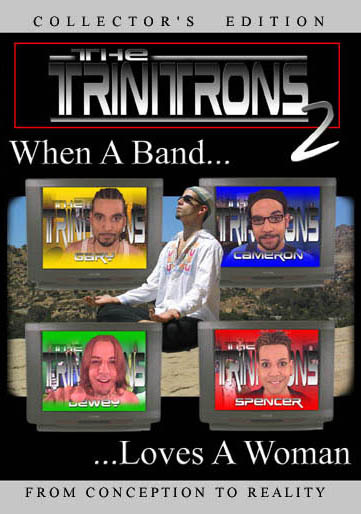 Come and listen to a story 'bout a band named "The Trinitrons," which is unlike anything you've ever seen before. Adam simply wants to sing his song, but G, Cam, Spence, and Dewey Dude won't let him. Why? Buy this and find out. Also, thanks to Spencer, we get to see Adam justify his later huge psychiatric bills when he hits on himself.